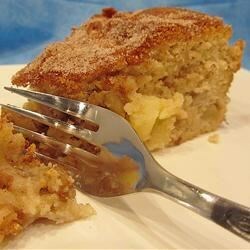 "A very moist and dense cake with apples and cinnamon, traditionally served during Hanukkah. It's a favorite in our household, and best of all, not from a box!" Preheat oven to 350 degrees F (175 degrees C). Spray an 8-inch springform pan with cooking spray. Beat 1 1/2 cup of sugar with the butter, vanilla extract, and cream cheese in a bowl until soft and creamy; beat in the eggs one at a time, beating well after each addition. Whisk together the flour, baking powder, and salt in a bowl. In a separate small bowl, stir together the cinnamon with 1/4 cup of sugar. Stir 2 tablespoons of the cinnamon-sugar mixture into the flour mixture; reserve the rest of the cinnamon sugar. Stir the flour mixture into the butter mixture to make a smooth batter, and mix in the apples. Pour batter into the prepared pan. Sprinkle the top of the batter with the reserved cinnamon-sugar mixture. Bake in the preheated oven until the cake pulls away slightly from the edges of the pan, about 1 hour and 15 minutes. Cool cake completely on a wire rack before removing the pan and slicing the cake. Very good flavor! The cream cheese really adds to this. Wonderful as is, but may add a few nuts to the topping next time. This cake was gone in less than 24 hrs. The recipe is perfect as is. Thanks for sharing. Wonderful flavor and texture. I doubled the recipe and baked it in a 9 x 13 inch cake pan. Turned out great!